My mind howls at the night. the urban lights a sensuous seduction. and put me on medicine. The soft glow of your face as you climbed the stairs. Or ungraceful moves, just the curls in your hair. Was left hanging in thin air, a prayer to send. My heart leapt though they say I can’t draw you near. But your face drew first blood from the moment we met. wow! 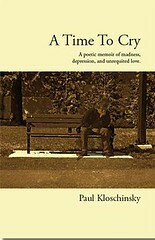 i am in awe of your book A TIME TO CRY Paul. i feel you man!